The typical Scottish diet contains too few fruits and vegetables and too much sugar and animal fats. This combination is not only bad for our health but unsustainable for the environment. Currently over 60% of the UK population are either overweight or obese.1 It is predicted that the population is.. The last few days have been spent researching the dietary management of endometriosis. I have been trying to find results of clinical trials done in this area. These are few and far between. Much information out there is anecdotal. This is not to be dismissed as many studies and reports.. 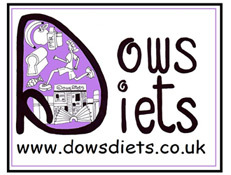 Thank you to everyone who took the time to visit the Dows Diets stall at the Turriff Show last weekend. It certainly was a big show with a great turnout. So much to see and so little time. It was my first promotional event for Dows Diets and the launch..
As Dows Diets launch day…D day approaches, I feel nervous about how it will all go. It feels like my third baby! The last 6 months have been spent nursing and developing the idea for Dows Diets into a business enterprise. I feel I am now in my nesting phase..